LEARN has planted the seed, and it is sprouting in the TREE neighborhood! 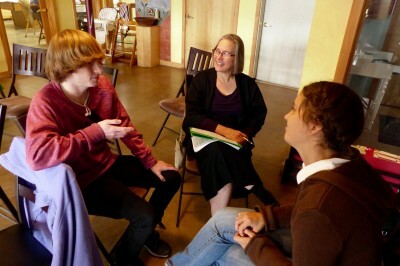 Over the past few years LEARN has been helping EcoVillage expand its understanding of how cohousing communities might organize and govern themselves more efficiently, more transparently and more kindly. Spearheaded by TREE resident Luigi Morelli and a small number of other residents, LEARN has brought visitors to the village to talk about “Dynamic Governance” (DG, also known as “Sociocracy.”) It has encouraged residents to take an on-line course in the subject, and it has co-sponsored a three-day weekend workshop in dynamic governance. This partnership between the neighborhood and LEARN has deepened and is beginning to blossom. From these efforts a core group of residents spent three months crafting a proposal for piloting this new governance system, in April 2016 the TREE neighborhood approved the proposal, and in mid-June 2016 the eighteen-month pilot in “dynamic governance” launched. DG involves changes both in structure and in processes. Our multiple committees are now grouped into four decision-making Work Circles. Each of the Work Circles has decision-making power in its sphere of responsibility and ensures that work gets done. With this power comes the responsibility for keeping the neighborhood informed about important imminent issues and decisions, and for making an effort to consider all perspectives as it crafts its final decisions. A Coordinating Circle, composed of a leader and delegate from each work circle, coordinates, archives and communicates to the total membership the activities and decisions of the Work Circles. The most comprehensive circle, composed of all TREE members and named the TREE Circle, makes decisions on major issues (such as significant/permanent changes to our community’s built environment, to our governance structure or to our financial, residential or legal responsibilities). It also gathers for “community conversations” in order for the Work Circles to get broader input from TREE members. And TREE anticipates joining together for celebrations and getting to know each other better through story telling, games, and other informal events. Over the eighteen months, TREE will evaluate the pilot, refine the structures and processes as needed, and finally decide whether to continue with the structures and processes of dynamic governance, modify them, or return to TREE’s current mode of governance. As the leader of the DG Team, I can say that TREE is thankful to LEARN for ‘planting the seed’ and inspiring us to undertake this adventure.